The southern end of the the 10-mile-long barrier island of Miami Beach is home to the Art Deco National Historic District, the only location in the United States to be so designated. It is comprised of a few dozen hotels and apartment buildings built primarily in the 1930's. These buildings are soaring examples of pre-war modernism with charactertic rounded corners and geometric ornamentation. 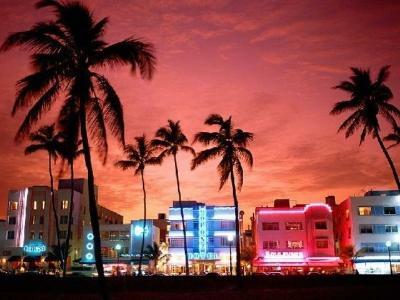 The highlight of the district is the strip of hotels along Ocean Drive between 5th and 15th street. While the area is thriving today, the southern region of Miami Beach has a less than perfect history. 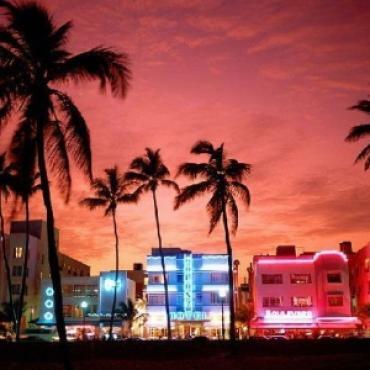 When the first buildings were completed in the 1920's during prohibition, South Beach soon became associated with liquor and gambling and attracted the likes of Al Capone! Several tours explore the Art Deco District including the “Underworld Tour” that will take you to former hotspots of illegal activity like Al Capone’s office. The Art Deco District is a fun, interesting place that begs to be explored. Be sure to visit the next time you’re in the Miami Area. Set on Miami Beach is the Art Dec Historic District Info Centre, pop into here and learn about the tours available, they've normally got cycling, self guided audio and escorted to choose from. Great place to purchase Art Deco posters too..